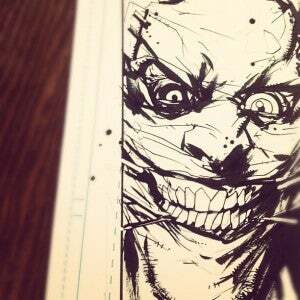 Earlier today, popular comics artist Jock tweeted the photo at right, which appears to be a full-on close-up of The Joker's new look. It seemed at the time that it would be controversial not only because fans tend to get up in arms about any changes to the "classic" looks of their favorite heroes but because Batman artist Greg Capullo, who apparently was one of the principal architects behind the change, complained earlier this week when DC solicited comics that had far less revealing images than this on the books' covers. Well, self-fulfilling prophecy, corporate standards and practices or something else, the Instagram post containing the image now seems to be gone, along with any reference to the image on Jock's Twitter account. Jock will be doing backup features for Batman #13-16, according to Batman writer Scott Snyder. There will be no backup feature for Batman #17, as it will feature the oversized finale to the upcoming Death of the Family crossover story, which will introduce Joker's grotesque new look.